IF YOU'RE WONDERING why anyone would make homemade butter when the stuff is so easily available, it's because you don't live in my small village. There are only two brands here, and every once in a while they develop an off-taste. I hope it's something picked up in storage, and not due to some new chemical in the milk. I use very little butter nowadays: a smidgin on my gorgeous homemade bread, of course; a generous dollop in mashed potatoes, naturally; a wee dot on vegetables... and that's about it. I don't make a lot of cakes and pies, but I would use it there too. For cooking, I've been using mostly virgin olive oil since way before it became fashionable, when it was still an expensive luxury. Back to our homemade butter. I hadn't made any since the seventies. I thought I had learned to make it from Julia Child, but I checked and I can't find a recipe for it in any of her books. It doesn't matter, since I remembered as if it was yesterday. If you know how to make whipped cream, you know how to make butter – butter is simply heavy cream that's been overwhipped! 1. Start with at least two cups of heavy cream (whipping cream or 35% cream) at room temperature. You can use a food processor or a stand mixer. I used my KitchenAid and started with the whisk, then switched to the paddle. 2. You need high speed to coax the cream into separating so don't try this with a hand whisk. Persevere and in a few minutes of beating, you will see yellow globules start to form, and some liquid will appear. 3. At this point I switched to the paddle and placed the whole thing in the fridge, including the paddle, just long enough to harden those little globules. 4. Continue beating until the butter comes together enough that you can see you will be able to pour off the buttermilk without pouring off some of the butter. (That's the best way I can describe that.) REDUCE THE SPEED or the buttermilk will start flying out of the bowl. Pour the milk through a moistened cheesecloth or a fine strainer while holding back the main part of the butter with something like a skimmer. Pour the milk into a clean container -- that's good stuff! 5. Once you get a nice mass of butter, pour off all the buttermilk and, keeping the butter in the bowl, go over to the sink and start washing your butter under cold running water in order to get rid of as much of the milk as you can. (If you don't, your butter will go moldy and rancid very quickly and it will burn too easily.) To do this, you massage it with your hands, separating it into small pieces, and you keep changing the water until it runs clear. 6. Now you have to get rid of the excess water. You do this by pushing the butter against the walls of the bowl with a spatula or wooden spoon. Do this several times until you don't see any more droplets. 7. If you want salted butter, now is the time to add some salt. Do it a little bit at a time and keep tasting till it's the way you like it. Salt does help preserve the butter, plus it tastes better on bread. You could salt part of it, and leave the other part unsalted. To make cultured butter, add 1/3 cup plain yogurt to every quart of cream, stir it in well with a wisk, cover with plastic and leave overnight in a warm room. (Use a squeaky clean glass or stainless steel bowl for this.) The cream will thicken slightly or develop a thick skin on top. The next morning, proceed as above or refrigerate until you're ready, but be sure to let it return to room temperature before making the butter. I turned my production into four small logs which I wrapped tightly in plastic wrap, and then I froze three of them. That way, I'll be sure that my butter is always fresh. The logs are nice because each slice is a perfect little pat. How Much Does Homemade Butter Cost? Making butter at home is probably not going to save you money. It all depends on the price of 35% cream where you live. But here, I found that it cost about 50% more than store-bought butter, and we pay more here for everything than in the big city. However, that cost is comparable to premium or cultured butter. Out of one litre of cream (one US quart), I got 350 grams (about 12 ounces or 3/4 pound) of butter. How Does The Butter Taste? The plain version was good because it didn't have that off-taste, but it wasn't as tasty as a good dairy-made butter; salt would have improved it I'm sure. Cultured butter is another matter. It was as good as the store-bought cultured butter. Would I Make Butter Again? Of course, if I had my own cows, I would definitely make my own butter. But if I lived in the city I would just buy premium or cultured butter there. After all, the cream from the big dairies is hardly pure stuff any more. I don't know when this happened, but it went from plain, 100% cream to: "Cream, milk, carrageenan, mono and diglicerides, cellulose gum and polysorbate 80." Homemade butter makes a great gift! Turn it into herb butter – my favorite is with garlic, parsley, lemon juice and grated lemon rind, and salt. Great on steaks, fish, just about everything! Pack it in a pretty crock and the recipient will remember you long after the butter has run out. 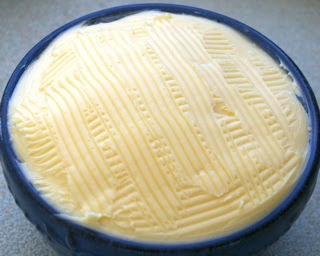 A good place to look for seasoned butter recipes is your favorite butter company's website, like this one. Just type "seasoned butter" in the search box. Taste your cream before you turn it into butter! See why in this previous post. I prefer cultured butter. I'm told that it can be made by leaving the cream out overnight prior to mixing it. An alternative to this, which i prefer as i get to say "inoculate," is to inoculate your heavy cream with plain yogurt (the sour kind) by putting a 1/4c yogurt per 4c cream. Mix it, and leave it out covered overnight. I've used the later method with success, though i am trying to figure out how to coax more flavor from the ingredients. It's been so long since I've had cultured butter – I lived in Mexico for 20 years before moving here and it's not available there – that I have almost forgotten how good it is. Thanks for providing the recipe for me and for my readers. Update: I tried Andy's recipe and had much success. I continued making cultured butter until Costco opened a branch nearby. Since then, I've been able to get really good cultured butter from Quebec at a very good price. I buy several pounds and freeze it.